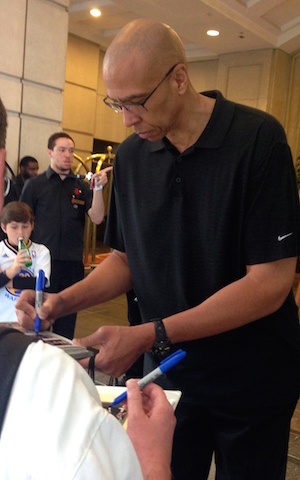 Mychal Thompson is a former NBA player, who played for three teams from 1978-1991. The Nassau, Bahamas native is perhaps best known for helping the Showtime Lakers to back-to-back championships in 1987 and 1988. These days, Thompson is still very involved with the Lakers, serving as the team's radio color commentator and co-host of a daily radio show on ESPNLA 710, the team's flagship station. Thompson has also been in the news because he's the father of Warriors star Klay Thompson, who's involved in the 2015 NBA Finals. Mychal basically serves as his son's manager, keeping the media updated on Klay's concussion, suffered in the Western Conference Finals. Mychal also recently had this to say about Cavaliers guard Matthew Dellavedova. "Dellavedova, he couldn't stop Steph if Steph was asleep," explained the 1978 first overall pick, after Dellavedova contained league MVP Stephen Curry, earlier in the finals. Mychal has been present at most of the Warriors postseason games. Last week, prior to Game 4 of the 2015 NBA Finals in Cleveland, Michigan based iFolloSports.com correspondent Lance Martinez captured the above original photo of Mychal signing in downtown Cleveland.